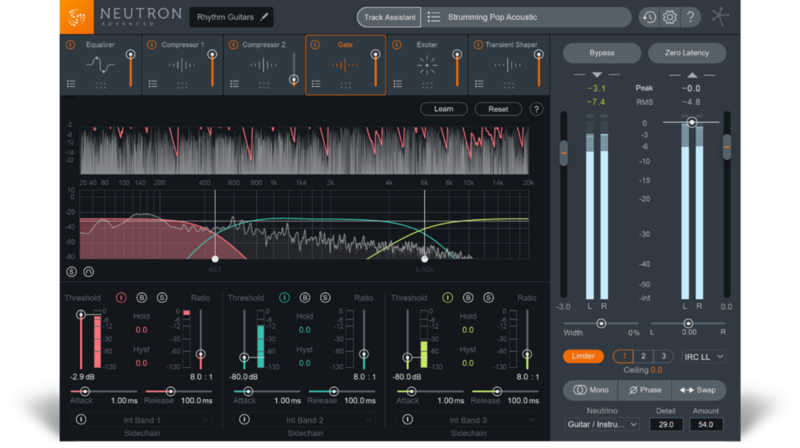 Today iZotope has released Ozone 8 and Neutron 2 as well as a Tonal Balance Control plug-in that can link the two tools together. In this article, we are going to take a closer look at the new features in Neutron 2. The new Tonal Balance Control plug-in introduces industry-first visual analysis and communicates with all instances of Ozone so you can shape a perfectly balanced master. You can instantly call up any Neutron EQ and adjust your tracks to targets based on intelligent analysis of tens of thousands of professional mixes. You can even create your own custom targets from one or more songs in your personal library. In this tutorial from iZotope, you can learn how to use the new Tonal Balance Control plug-in with both Neutron 2 Advanced and Ozone 8 Advanced. iZotope Product Specialist Geoff Manchester walks you through what Tonal Balance means, how to understand the new metering available in the plug-in, how to fix tonal balance issues using Neutron 2 Advanced and Ozone 8 Advanced, and offers tips on how to incorporate it into your workflow. The Tonal Balance Control plug-in has been designed to communicate with the Neutron 2 and Ozone 8 Equalisers (available separately). This new inter-plug-in communication helps you fix mix issues that can hinder mastering and helps to bridge the gap between the two. No more context switching or opening up multiple windows. The new Visual Mixer is designed to create a picture of the entire soundstage, offering you control over individual tracks and enabling you to quickly and intuitively set the contour of your mix—all without leaving the window. Control the pan, gain, and width inside of Neutron so your mix sounds exactly how you intended. Neutron's Masking Meter is designed to allow you to visually identify perceptual frequency collisions, which can result in situations like guitars masking lead vocals, bass covering up drums, and other issues that can cause a "muddy" or overly crowded mix. Toggle between any two tracks to carve out sonic space and ensure that each instrument has its own place to shine. IZotope understands that producers and engineers don’t always use iZotope plug-ins on every track, but you can still route any of your tracks to the Tonal Balance Control plug-in, Visual Mixer, or Masking Meter from the new Mix Tap plug-in. You can enjoy the flexibility of using any plug-in while still getting all the benefits of their new tools across your entire mix. Neutron’s updated Track Assistant has been designed to let you create a custom starting point based on your audio so you can focus on what’s most important—your creative take on the mix. 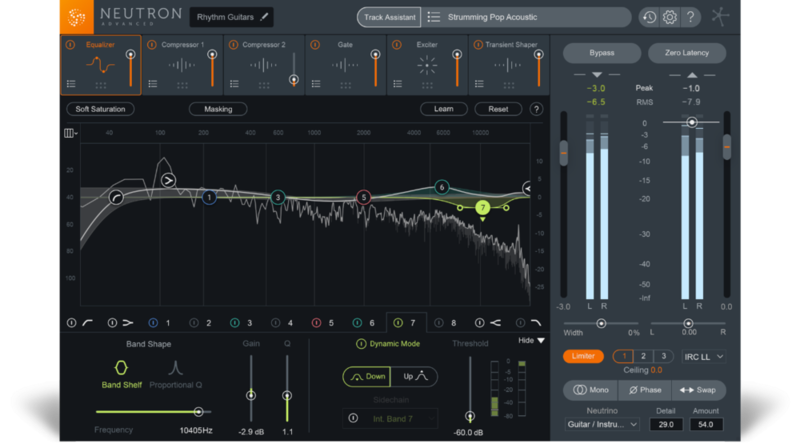 In Neutron 2, iZotope has made some improvements including piano instrument detection based on machine learning, the ability to automatically set release, ratio and attack on the Compressor. We have not said much about using Neutron 2 in post-production. You can use the Track Assistant in Neutron 2 Advanced to quickly analyse and set a starting point for your audio across Neutron's six zero-latency, CPU-efficient audio processors. Highlights include a BS.1770 True Peak Limiter, multiband Gate with Hysteresis, EQ Learn, dynamic EQ to sonically balance sub-mixes, dialogue-polishing Neutrino mode, and 7.1 surround sound support across all modules. Neutron 2 now includes six mixing processors, all zero-latency capable, including a new Gate with hysteresis, a static/dynamic Equaliser with analogue-inspired soft saturation, two multiband Compressors, a multiband Exciter, and a multiband Transient Shaper, as well as an ultra-low-latency True Peak Limiter. 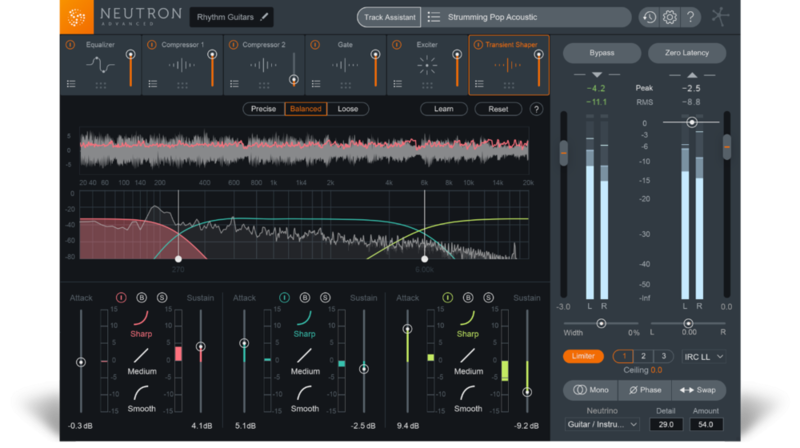 Neutron 2 is now available from iZotope and select retailers.